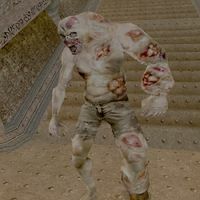 Ash creatures are horrific monsters spawned by Dagoth Ur through connection with the disease known as Corprus. They can most commonly be found in the vicinity of Red Mountain, although exceptions do occur throughout the game. "What are you doing? You have no idea. Poor animal. You struggle and fight, and understand nothing." "A bug. A weed. A piece of dust. Busy, busy, busy." Understand nothing: "You think what you do has meaning? You think you slay me, and I am dead? It is just dream and waking over and over, one appearance after another, nothing real. What you do here means nothing. Why do we waste our breath on you?" On the Xbox Game of the Year edition, they use Werewolf noises. This is because they do not have a properly assigned sound. 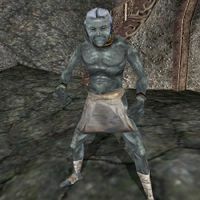 Ash Ghouls, also called Ash Poets by members of the Sixth House, are half-Dunmer, half-beast creatures created by the dark magic of Dagoth Ur. 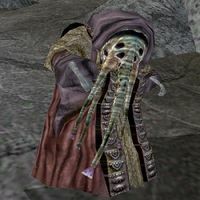 Like Ash Zombies, they appear to be Dunmer which have had their upper faces removed, but unlike Ash Zombies there is a wormlike proboscis growing out of the hollow space. 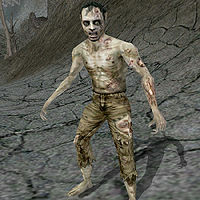 Note that despite being called "ghouls", these creatures are not actually undead (only Dagoth Baler is set "undead" instead of "humanoid" in the game) and contrary to NPC dialogue, do not drop Ghoul Hearts. Dagoth Ur: "He will not come to you, Lord Nerevar. It is you who must beg forgiveness. Go to him, beneath Red Mountain, kneel before him, and he will show you mercy." Fallen brother: "The soul of Dagoth Gares is among us. You have broken his body, but his spirit is with us in our waking dreams." 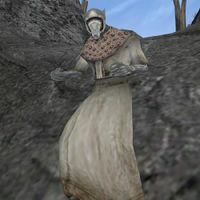 Will not submit: "You have chosen war with Dagoth Ur. We grieve for your loss, but we will not spare you. You refused the sweetness of Lord Dagoth's friendship. Now know the bitterness of his fury." 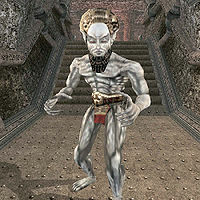 A deranged humanoid creature created by the dark magic of Dagoth Ur. Approach with caution, as they will often use ranged destruction spells against you. "The chairs. The tables. All confused. We hear the words, and must speak them. We take them, and arrange them, but still, they will not be quiet." "Everything is wrong. This is not straight. This is too high. This is in my way. We must put them right." are their two possible greetings. Very powerful creatures created by the dark magic of Dagoth Ur. They serve as the nobility of the Sixth House. Note that despite being called "vampires", these creatures are not actually undead, and it isn't possible to catch vampirism from them. Unlike other creatures, there are no generic ash vampires. 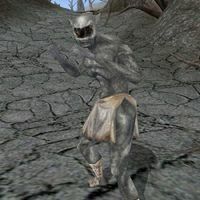 * Morrowind Patch Project 1.6.6 changes their "Fight" stat from 90 to 50. Most likely so that the player could properly talk to them before combat. "WHERE ARE YOU, LORD? We cannot hear you.... SPEAK to us! PLEASE!" "What are you? Where is this place? I'm so tired, LET ME SLEEP!" Deranged and deformed victims of the dreaded Corprus Disease, which has no known cure. Care must be taken when confronting these creatures as they have become incredibly tough owing to the disease. People in the game may warn you that you may be infected with Corprus by fighting Stalkers, but this is untrue: the only ways to become infected are during the Sixth House Base quest (this is completely unavoidable by any means), and from Tanusea Veloth. A deformed and deranged victim in the advanced stages of the dreaded Corprus Disease. The disease greatly increases the victim's Strength and abilities which makes these dangerous opponents. Like Corprus Stalkers, you will be warned about the threat of catching the uncureable disease from them. Again, however, this is not true, though you may catch Black-Heart Blight from them instead. This page was last modified on 23 November 2018, at 07:21.